Hair breakage is definitely cause for concern and can almost always be reversed. Most of the time, taking better care of your hair and giving it a little bit extra of tlc will do the trick. Here are my top 10 tips for stopping and preventing hair breakage. 1. Trim your ends regularly- Not trimming your ends regularly causes split ends and leads to breakage. Continuing to postpone getting trims allows the ends to continue to split up the hair shaft, resulting in having to get more hair cut once you finally break down and get your hair trimmed. Every six to eight weeks is a good time frame for getting ends trimmed. 2. Stop doing your own relaxers- Doing your own relaxers, (or allowing your daughter, sister, niece, cousin, friend, mother, brother's girlfriend, neighbor, etc to do it for you) is not recommended. You can not see what you are doing, which leads to overlapping, causing breakage. Leave the chemicals to the professionals. 3. Stretch out your relaxers- Instead of getting relaxers every six weeks, try going fourteen to sixteen weeks. This allows more new growth to actually be relaxed, reducing the risk of overlapping and breakage. 4. Use heat sparingly- The less heat you use on your hair the better your chances of not getting heat damage which leads to breakage. Also, when using your heat tools, make sure it is on the lowest setting that your hair will allow. Don't put your heat tools too low though, or you will find yourself doing multiple passes on one piece of hair. Aim for only one pass with the flat iron or curling iron. 5. Keep a moisture/protein balance- Try to refrain from getting deep conditioner after deep conditioner. The moisture is great, but the hair also needs to protein to remain strong. Having a healthy balance of both allows the hair to become its healthiest, and reduces chances of breakage drastically. 6. Use a wide toothed comb when detangling wet hair- Hair is more fragile when wet so it is important to be extra gentle with it. Using a wide tooth comb helps to detangle and reduce the hair from breaking. 7. Eat foods that will aid in hair health- Eating a diet that includes lots of fruits and veggies is a key factor to having healthy hair. These foods contain vitamins that aid in hair growth, health, and strength. Be sure to eat foods rich in iron, protein, zinc, vitamin E, vitamin A, and B vitamins. Being healthy on the inside shows on the outside, and that pertains to the hair as well. Taking a multivitamin also helps our bodies receive the key vitamins that we miss from our diet. Doing this guarantees breakage will not be a hair problem that you face. 8. Restrict your use of styles that put strain on your edges- This includes ponytails, braids, sew-ins, or any other style that causes stress on your hair. 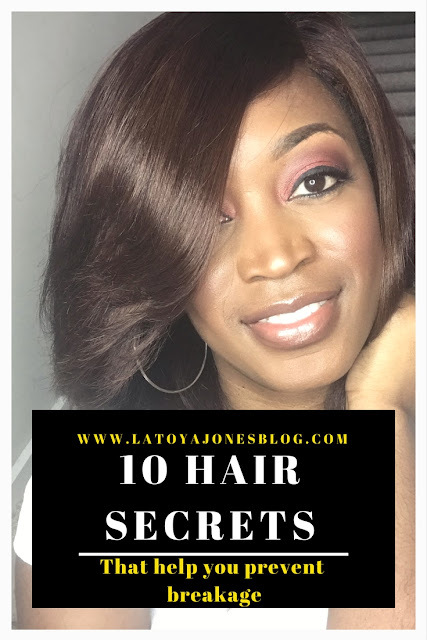 The edges are the weakest part of the hair and frequently straining them by having styles that are too tight causes breakage, and can even lead to alopecia in some instances. There is nothing wrong with these styles if worn correctly, just be mindful when getting them. 9. Shampoo your hair regularly, but not too much- Shampoo your hair as needed. Shampooing too much can cause the hair to dry out, making it more prone to breaking. Avoid this by only shampooing as your hair needs it. 10. Pick one chemical or the other- Most people will not take necessary care of their hair when they have more than one chemical in it like color and relaxers. It requires a lot of upkeep to stop the hair from breaking. I recommend picking one and sticking with it. Either relaxers OR color, but not both. It's really informative blog by having the info regarding prevention of hair breakage which will be very helpful to have the natural hair growth, Good gathering..... Thanks.